A railroad line crosses over the Mt. Vernon Trail and the George Washington Parkway to enter Long Bridge Park from the north. Pedestrian and cyclist access to Long Bridge Park would be improved with a trail overpass paralleling this rail overpass. Pedestrians and cyclists using the Mt. Vernon Trail are currently making their own trail to connect to Boundary Channel Dr. next to large Pentagon parking lots. This well-worn improv trail highlights the need for better Mt. Vernon Trail connectivity in this area. 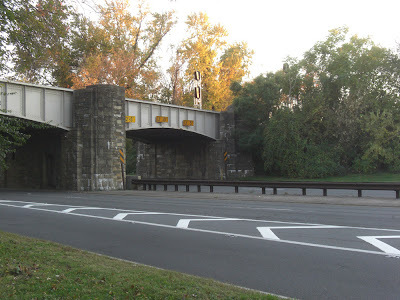 LBP needs the connection to the Mount Vernon Trail! for more information about the future of the park. The 2nd phase of the park is supposed to include a direct bike connection to the Mt. Vernon Trail from the north end of the park. But it might be a few years before everything is planned out and built. An alternative connection could be the path from the south side of the Humpback Bridge. The underpass leads to a short trail in the general direction of Boundary Channel Drive. As you pointed out, that trail is not paved all the way to the road. That trail can be paved sooner than the park esplanade can be extended. 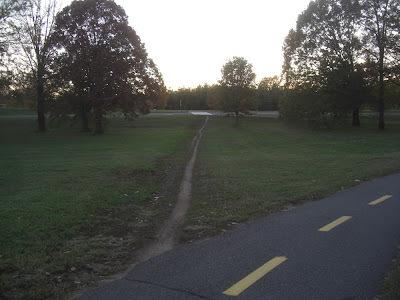 Apparently the Pentagon is reluctant to allow a paved trail in that area, but cyclists can already access that location relatively easily. It's not a highly-secured area of the Pentagon grounds. A bike trail isn't going to reduce overall security on the Pentagon grounds. I hope the County can work out an arrangement with DOD in the coming months.